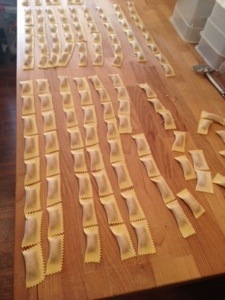 Beet-Goat Cheese Ravioli is one of our most popular vegetarian pastas. We roast beets then mix with Goat Cheese and to make it even more creamy Mascarpone. You can serve this pasta by tossing with a simple melted butter and fresh thyme sauce. Another idea is to serve with a kale or chard sauce. We think that the bitter from chard or kale helps to balance the sweetness of the beets. Next, scoop out ravioli from the water with a slotted spoon and place in the sauté pan along with the shallot and kale. Gently toss together and allow the pasta to absorb some of the sauce. If the sauce is too “tight” this is the opportunity to add some of the pasta water to the sauté pan. Plate the pasta and finely grate parmigiano on top. Buon Appetito!